Fruitless Pursuits: Oz: The Great And Powerful Review! 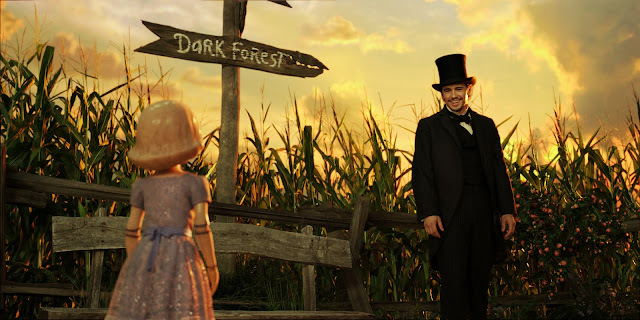 Oz: The Great And Powerful Review! While most of our staff is at the Oz Comic Con, I took an impromptu trip to Oz: The Great and Powerful. With just a few hours notice, I had no time to read my books or watch the classic film… so I went in with just my memories of The Wizard of Oz, which hold up pretty well (at least the first half of the film. There are some parts toward the end that I may have never seen). In this new film, James Franco plays the great and powerful Oz, a second rate magician who wants to be more than what he is. 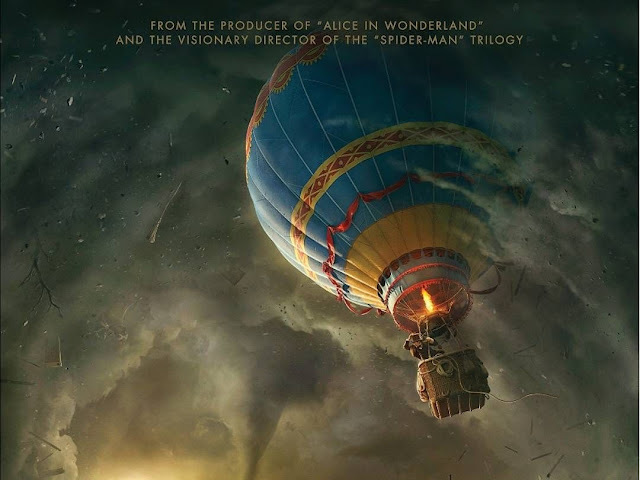 In a blustery day, he gets whisked away to the land of Oz in a hot air balloon and is instantly recognized as the man they have been waiting for, the great Wizard of Oz. His journey starts here. 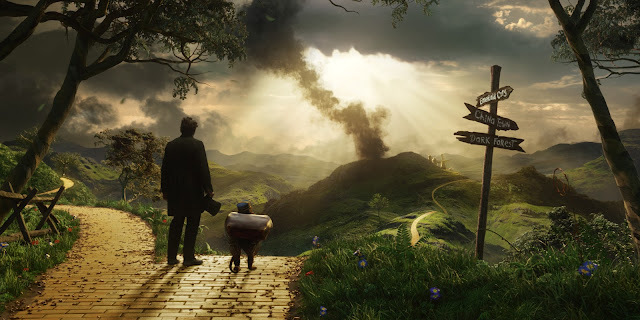 I love the setting of Oz and was really excited to hear that a new film was being made. The casting choices seemed interested, but they were backed up by a solid team of L. Frank Baum (kind of), Sam Raimi and Danny Elfman. L. Frank Baum shines, as the story is wonderful. Sam Raimi kept the massive budget film grounded with some interesting and jarring camerawork, and Danny Elfman is barely heard. Overall the film moves a mile a minute (in a good way) and was fun, enjoyable, and even pretty heavy towards the middle/end. There are a few memorable characters here, but outside of Oz himself, most are underused (porcelain girl) or unlikable (witches). The films biggest weakness is that it's going to be compared to The Wizard of Oz, and nothing will ever match that film. But I can say that this does represent it well. While not as upbeat of a story, it has its funny and light moments. Thankfully, the humor doesn't really dip into anything embarrassing or offensive. And it kept the references to the classic film at a very subtle level. Oh... and this isn't a musical. Not even close. Oz meets a handful of witches, which will leave you asking "which witch?" for a while. This is all good, as illusions are the main focus of the story. As he bounces between witches he also meets a monkey butler and porcelain doll girl. While neither is quite as charismatic as the Scarecrow, Tin Man, or Cowardly Lion the little girl has some serious soul. She's a little heartbreaker in every seen she steals. Once the gang is formed, and just about all of the main characters know that Oz is full of crap, a full on war has started and Oz needs to jump into action. I'll let you see the rest. This movie was long, and yet never felt long. The pacing is so fast that you don't realize that you've just zipped through 10 scenes. This movie was pretty violent. Not Call of Duty levels, but the witches are ruthless and inflict some serious pain on each other. The battle scenes were also pretty epic. I don't think they pulled any punches here. Mostly the battles were filled with emotion. Very well done. I'm a James Franco lover, and continued to love his pretty sassy role as con man turned better con man. I don't want to say he could do no wrong because he did Your Highness... but this character is very flawed, and were constantly reminded that he isn't a wizard at all, so I think James Franco was a solid fit. The movie is generally pretty funny. The jokes are good and mostly pretty timeless. Mila Kunis was ok. I was worried about her and I'm not sure why. She seemed so lifeless in the trailer and isn't so much in the beginning. But when (BIG SPOILER) she eventually turns into the nasty green Wicked Witch of the West, she looks like she's made of bloated rubber. It's one of those weird choices that I don't get. It's not cool looking, or even that good. I'm guessing it was CG and the best they could do? There was a spot in the middle where Oz hemmed around trying to figure out what he was going to do. It hung around here a little too long and then it just clicked for him and we moved towards the big ending. Actually a few of the big plot points felt like they hovered around and then rushed into resolution. There was too much 3D nonsense. I didn't see the film in 3D but early on there are things flying into the camera that were so unnecessary. 3D essentially is a marketing medium, and I'd hate for that to tarnish the legacy of any film. But there are a few cringey 3D moments that were kind of unnecessary. There were basically no songs. The original Wizard of Oz was a musical, so I would have loved to see a song by a main cast member. It could have even been in a jokey way, and I'm unsure why nobody went there. The one song was weird. The munchkins do about half of a song and it dipped into Tim Burton Oompa Loompa song territory. Danny Elfman is a fine composer, but once a voice is added into his songs, they just feel weird. It may not be his fault but the volume change from a normal speaking voice to a singing voice is the worst part. The singing voices are really toned down in his songs and feel fake. It doesn't feel like one of the characters busted into song. The movie looks a little odd. It's partially obvious that about only about 1/2 of a scene takes place on a set. A few obvious green screen moments, a lot of mega close ups, and some general fuzziness around the edges makes it odd. I'm missing the grittiness of an actual set here and there. I definitely enjoyed it and would see it again. Despite the flaws, it feels like a pretty fitting and appropriate return to the land of Oz. I would be up for more Oz stories from this cast and crew. Just please put a song in next time! That's exactly what the movie is: fun. Granted, the movie does have its fair share of flaws, but it's still enjoyable. Good review Jason. I think you're review was on point. I do however disagree with James Franco playing that part accordingly. I love me some Franco as much as the next person, but his character seemed too extremely played down. I personally would have listed him under "Ok". There were too many moments in the film that felt emotionally unfulfilled. Almost a monotone personality that attempted at carefree but didn't quite get there. He did much better in the first scenes where he was a full on con-artist. As soon as he landed in OZ, his mind went elsewhere as well as his acting skills. Thanks Jessies. I agree that the first scenes were where James Franco really shined. Those were probably the only scenes that weren't 100% green screen too. Connection? Oz Comic Con Perth 2013: Day 1 Highlights! Book Review: The Art of Sucker Punch!